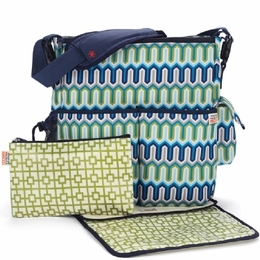 Our Jonathan Adler for Skip Hop Duo Diaper Bag includes Adler's groovy patterns, plus a special coordinating laminated zip case and changing pad. The Duo's multitude of pockets and compartments easily organize diapers, bottles, and toys, while keeping your phone, wallet, keys and other personal items safe and dry. The Duo includes patented Shuttle Clips, allowing it to quickly and easily convert from a shoulder bag to a stroller bag.